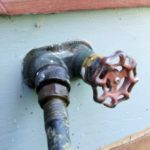 Disconnect garden hoses from outdoor spigots. Turn off the water supply to those spigots. If you don’t where the shut off valves are, they are usually located in the garage or in a closet. 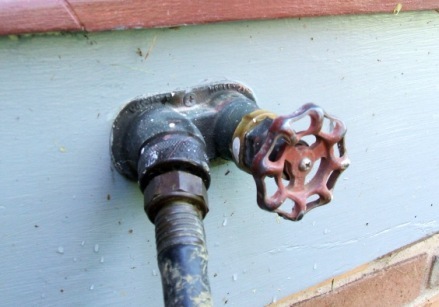 Once you turn off the water to the spigot, go outside and turn it on to drain any remaining water. This also makes sure the water has been turned off. Start winter off with clean gutters! Clogged gutters and downspouts can cause damage and cost you money down the road. Check the seals around your exterior doors. Replace if torn or missing. Don’t forget the door sweep. This is the vinyl strip attached to the bottom of the door. To replace this, the door may have to be taken off the hinges. Fill cracks around doors, windows and trim with a quality caulk. Options are water based acrylic latex with silicone, solvent based urethane or elastomeric. Solvent based caulks supposedly hold up better for exterior use. DO NOT use 100% silicone. Some caulks are available in different colors to better match your home. You can also use clear caulk, which comes out white but dries clear. If using the clear, wipe off excess with a damp cloth before it dries because it will have a glossy sheen to it. Closing these vents will prevent cold floors and keep water pipes from freezing. Check the crawl entry door and make sure it’s closed.